Cause a racquet in your community and organize a USTA Block Party! 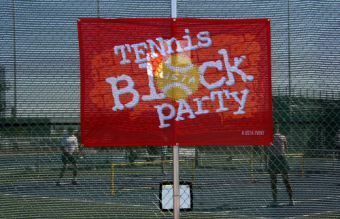 Tennis Block Parties are easy to organize and provide a great platform to promote your local tennis programs to players of all ages and abilities. These events can be hosted at any public facility and should feature two to three hours of tennis instruction, interactive games, and attractions for player of all ages and abilities. These events showcase the unparalleled health and social benefits of tennis in a fun and dynamic way while achieving three main goals: Introduce new players to the game and your local programs; generate excitement in players; and create awareness about the USTA and its programs such as USTA Jr. Team Tennis, Quickstart Tennis format and USTA Leagues. For more information, contact USTA Southwest Marketing and Communications Manager Jeff Sikes at sikes@southwest.usta.com.